When it comes to surfacings and driveways, many options can look the same to the untrained eye. Even more confusingly, the same names can be used to mean different things in different parts of the world, so finding a definitive answer online can be tricky! The composition of such surfacings – for example, tarmac, bitmac and asphalt – does indeed vary, resulting in a different set of properties and advantages. In this article, we’ll pick apart the subtle differences between tarmac and asphalt. Tarmac, which is short for tarmacadam, was patented back in 1902. The material is formed by mixing aggregates with tar which has been modified with small measures of resin, Portland cement and pitch. This mixture is laid and then compacted with a vibrating roller to form a smooth and strong surface. 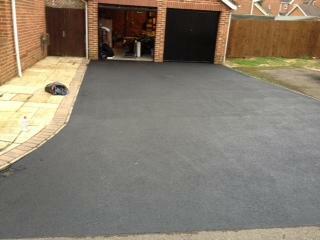 Top coats can also be added to improve appearance and to enhance properties such as permeability. These days, tarmac in its true form is rarely used. Instead, bitmac now tends to be used instead, which, instead of using tar uses bitumen – a byproduct of petroleum distillation. Due to the prevalence of petroleum distillation, bitumen is quite readily available so, consequently, bitmac has largely replaced tarmac now. Confusion can often arise over what asphalt is, largely due to the fact that Americans call bitumen ‘asphalt’. In Britain, however, what we call asphalt is very similar in composition to bitmac. It is a surfacing material which also uses bitumen to bind together a mix of mineral aggregates. The blend of bitmac aggregates tends to have a higher sand and filler content than asphalt though. Asphalt also differs in its sustainability to other options. An older asphalt surfacing can be scraped away and the material recycled, allowing it to be reused in surfacings again. UK Surfacings Ltd have a team of skilled and experienced contractors who can carry out professional surfacing work for domestic and commercial clients. Our dedicated, well-trained team offer a high standard of workmanship and a wide variety of surfacing options, including tarmac, resin-bound and block paving. Get in touch with our helpful staff today with any enquiries – we operate in and around London, Croydon and Surrey. « Should I move house or stay and renovate?